What do users think of the city’s NextRequest System? The San Diego chapter of the Society of Professional Journalists wanted to know what users think of the city of San Diego’s public records request and information system. In the spirit of Sunshine Week, SD-SPJ is releasing our results and analysis of a public survey we conducted on how the NextRequest system has worked for users. When NextRequest launched in March 2016, the stated goal was to help boost “transparency and openness.” Our mission behind this survey was to find out if the system did just that, by asking users their opinions on how the system has worked for them. For local journalists and other members of the public, the system has become a vital tool when seeking information about city government operations. Since its launch, NextRequest has received more than 7,400 requests for records, according to city data. “I think the process behind the [NextRequest] site is a bigger issue than the site itself,” one survey participant wrote. 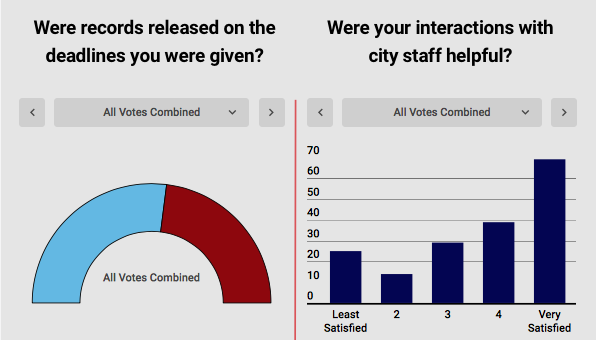 The survey of 10 questions was live for a little over two months and asked NextRequest users to rate the system and city’s effectiveness when it comes to releasing information in a timely and efficient manner. SD-SPJ analyzed data for requests filed via the NextRequest system in 2016 and 2017. More than 5,800 requests were filed in those years and for requests where records were located by city staff, it took an average of 17 days to release them to the requester. Fifty-four percent of those surveyed said records were released on the deadlines they were given by city staff. More than two-thirds of survey participants voted they had no technical difficulties with the system. One complaint brought up in the survey was the lack of communication between the requester and the city staff within the department they are requesting records from. “There needs to be department contact who can help navigate through the city documentation system for those of us who are not familiar with the ins and outs of how things are filed and preserved,” a survey participant commented. The SD-SPJ board hopes to use the survey responses in future discussions with city of San Diego staff regarding how the system is working and what needs improvement moving forward. Who deserves to be San Diego’s ‘Journalist of the Year’?